HM20 and related Hemolog software – with STBTC’s Blood Establishment Computer System (BECS). 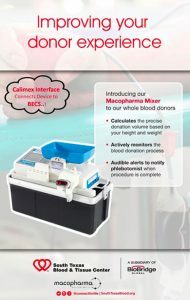 Macopharma’s MacoMix HM20 are automated whole blood mixers that determine the safe blood donation volume for each donor based on donor’s height and weight, actively monitor the donation process and alert phlebotomists when procedure is complete. Data is collected from the MacoMix while donation is in process. Data from the MacoMix HM20 and Hemolog software are then presented to STBTC BECS and Eldorado Donor for upload. Calimex USA developed the interface that transfers data to and from the mixers, thereby providing a paperless donation process. “We are excited to announce this great achievement in partnership with STBTC leadership and staff. Together we are bringing innovation to the blood collection industry.” stated Roxane Smith, National Sales Manager for Macopharma USA. “ It has been our pleasure to partner with Macopharma in its excellent products and services and with STBTC in their pioneering spirit to provide excellence to their donors, customers and staff. We have been innovative, collaborative and thorough to become their critically important partner. We are proud and appreciate this opportunity to contribute to this success” said Sam Waran, President/CEO of Calimex.